I’ve recently started a phased retirement, and am finally able to write reviews of the components that impressed me the most during the last 18 months. This also enables me to write about components which I have had in my system for long stretches, so for the foreseeable future my reviews will be based on long-term listening experiences. One of these components is the Stealth Audio USB-T Select USB cable. Stealth makes 3 versions of its USB cables: USB, USB-T and USB-T Select. The “USB” is the least expensive cable, while the USB-T Select is the most expensive, at $1,650 for a 1-meter, and $350 for each additional meter. The USB-T Select reviewed here is a 2-meter version. Visually, Stealth Audio USB cables are black/grey and flat. Stealth advises that the conductive material is their own proprietary copper-based alloy, but that doesn’t tell me much except that the folks at Stealth know a thing or two about materials science. It’s also my understanding that the company’s connectors, including its USBs, are carbon fiber shells proprietary to Stealth. Perhaps in another time I’ll be able to get insight into the technical reasons for materials selected, but for now you can refer to Stealth’s website. The “T” in the title stands for “tunable”. 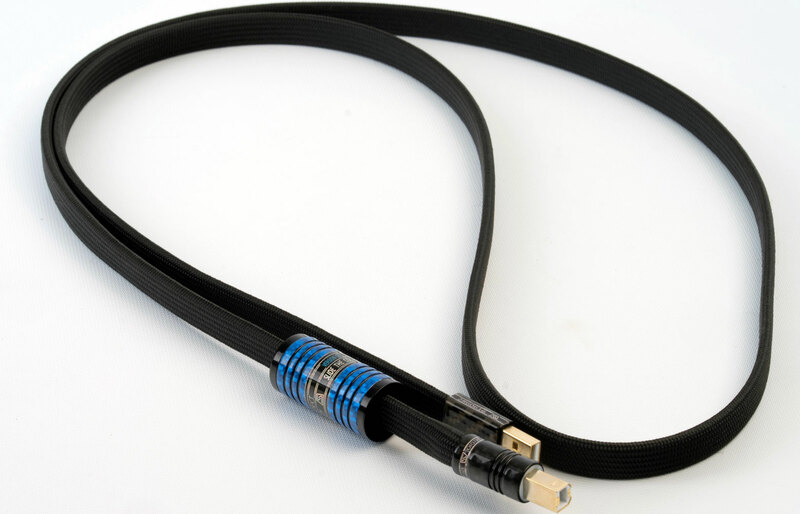 I first became familiar with Stealth’s tunable cables when I purchased Stealth Dream v14 tunable loudspeaker cables. The sliding ferromagnetic collar allows the user to fine-tune the sound. This does several things, one of which is a much higher likelihood that you can precisely match your speaker cables, speakers and amps. It’s a bit of a painstaking process – you need to be patient – but when you find the sweet spot it’s amazing how the sonic picture falls into place. The Select version of the USB-T is hand-built and hand-tuned, which means it’s more labor intensive than the base version, and Stealth says this is why the price for the Select is higher. I did not compare the Select version to the standard USB or the USB-T.
Superior Server Output vs. Superior DAC input. For a year and a half the digital connection between my then-primary server and my DACs was the Stealth Sextet V-16-T. It is a coaxial SPDIF digital interconnect with a tunable collar. I used it both with my MBL 1611 DAC with volume control and with my Legacy Audio Wavelet DAC/Digital Preamp/Room Correction/Crossover (see my prior reviews). It was very good. There were only two reasons I wanted to try a USB interconnect. One was that the Wavelet (but not my MBL) included a USB input that accepted higher resolution files. The second was mostly curiosity. On the one hand, the Qsonix server I was using at the time incorporated a high quality Wadia-designed SPDIF output, but still included a USB output. On the other hand, Legacy had recommended that the Wavelet’s USB input is the preferred input for use with a server. What was more important in my case – the superior output of the server or the preferred input of the DAC? Experimenting With USB. I first used the USB cable supplied by Legacy with the Wavelet. I really don’t know whether that cable is “standard” or actually upgraded in some way. (As I discuss further below, the Wavelet USB input is a micro USB input, which is not usually regarded as “standard”, so the supplied USB cable has a male micro USB connector at the “output” end.) Quite frankly, I was very surprised about how good it sounded. The sound I was getting using the Qsonix’s SPDIF output into both the MBL 1611’s and Wavelet’s SPDIF inputs was excellent, but it was clear that the Wavelet’s USB input was very good and made a difference in the sound quality. That convinced me to go further and start comparing USB cables. I next acquired an Audioquest Cinnamon USB-A to USB micro. At the same time I purchased an Audioquest USB A-to-USB micro adaptor (since few USB cables come in micro format), as well as an Audioquest Jitterbug to experiment with. The Cinnamon is a $60 USB cable, and has received some good reviews. The Cinnamon produced a somewhat more refined sound than the cable supplied with the Wavelet, with a nice soundstage. It is lively, but still with less body and slam than I prefer. Next, I borrowed an Audioquest Coffee USB cable. Its output end was USB-A, so I needed to use the USB A-to-USB micro adaptor. The improvement in the sound was unmistakable and obvious even to a casual listener. The sound was fuller, warmer, and also more detailed. Interestingly enough, I got a slight further improvement by adding the Jitterbug in the chain, which added another layer of clarity. I had suspected that, like other cables, USB cable construction mattered, but this provided very direct proof.